Below are mass shootings in Canada over the past three decades. TORONTO, ONTARIO: July 22, 2018 - A man walked down a busy Toronto street, shooting randomly into restaurants. He killed two people and wounded 13, before turning his gun on himself. QUEBEC CITY, QUEBEC: Jan. 29, 2017 - A man opened fire during evening prayers at a mosque, killing six people and wounding five. Twelve others were treated for minor injuries. LA LOCHE, SASKATCHEWAN: Jan. 22, 2016 - A student killed his two brothers at home before opening fire at a remote community high school, killing two more people and wounding seven others. EDMONTON, ALBERTA: Dec. 29, 2014 - A man killed eight people, including his wife, before killing himself. MONCTON, NEW BRUNSWICK: June 2014 - A gunman killed three Royal Canadian Mounted Police (RCMP) officers and wounded two others. 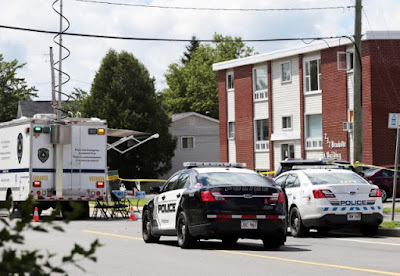 TORONTO, ONTARIO: July 2012 - Two rival gang members opened fire at a block party in the West Hill neighborhood, killing two people and injuring 23. MONTREAL, QUEBEC: September 2006 - A man opened fire at Dawson College, killing one student and injuring 19 before killing himself. MAYERTHORPE, ALBERTA: March 2005: A man killed four Royal Canadian Mounted Police officers who went to his home to execute a warrant to repossess property. The man then killed himself. OTTAWA, ONTARIO: April 1999 - A former employee of Ottawa’s urban transit service killed four of his colleagues and wounded two others before taking his own life. VERNON, BRITISH COLUMBIA: April 1996 - A man killed nine relatives gathered for the wedding of his estranged wife’s sister, and wounded two others, before killing himself. MONTREAL, QUEBEC: August 1992 - An associate professor at Concordia University killed four of his colleagues and injured one person. MONTREAL, QUEBEC: December 1989 - In Canada’s worst school shooting, a gunman killed 14 students, all female, and wounded 13 at the Ecole Polytechnique before committing suicide.